To accompany the RAI Special Lecture by the Hon. 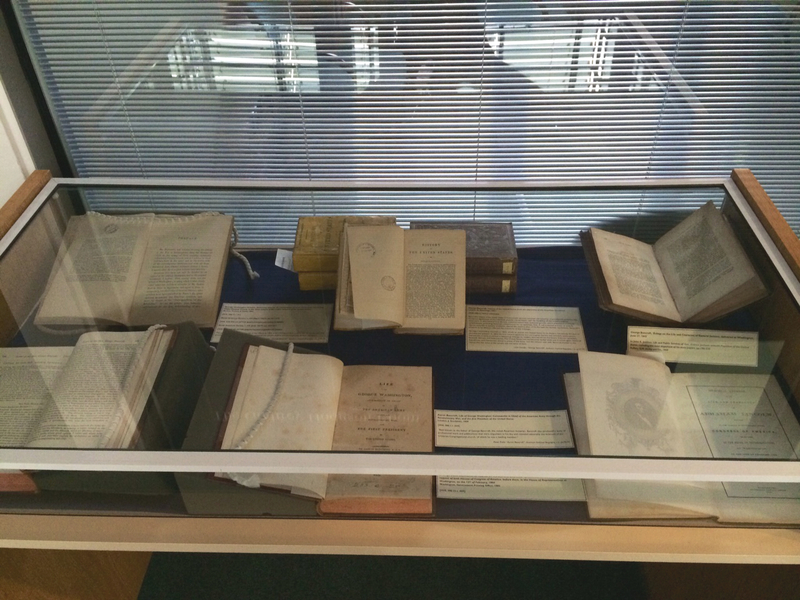 Christopher Bancroft Burnham, we have set out a small display of materials from the library’s collections relating to his ancestors, George and Aaron Bancroft. The display contains 19th century volumes of George Bancroft’s History of the United States, as well as a rebuttal from George Washington Greene and ensuing correspondence between Greene and Bancroft in the North American Review following the publication of the ninth volume of the History in 1866. (Greene took issue with Bancroft’s depiction of events relating to his ancestor, Major General Nathanael Greene, during the Revolutionary War). As well as these volumes, we have also displayed printed copies of Bancroft’s eulogies for Andrew Jackson and Abraham Lincoln, as well as Aaron Bancroft’s Life of George Washington, published in 1808. The display may be viewed in the library until Friday 7th November. This year’s Graduate History Information Fair will be taking place at Exam Schools on Wednesday 29th October from 3-5pm. 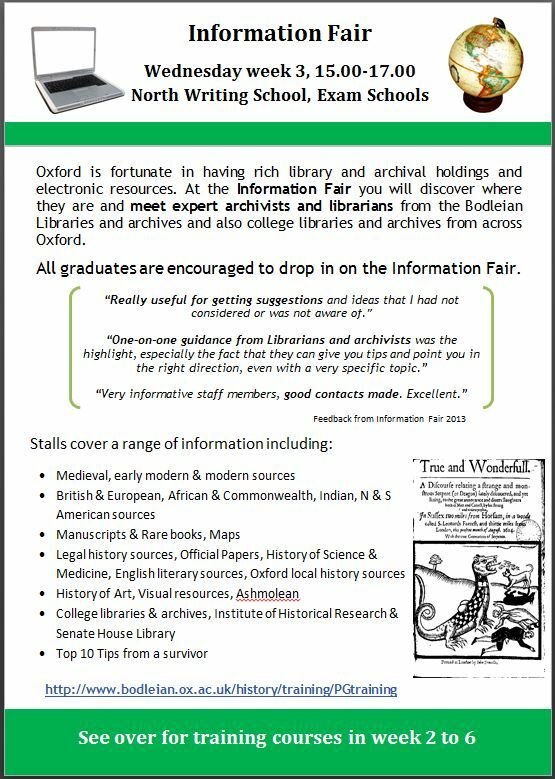 Drop in to speak to expert archivists and librarians from across the Bodleian Libraries, college libraries and other history research libraries and find out more about the collections and resources available for your research. Don’t forget that we currently have trial access to ProQuest History Vault and to the digital archives of The Nation, National Review and The New Republic. The History Vault trial ends on 31st October so you have just 10 days left to make use of its collections. The magazine archives will be available for just over another month, until 24th November. If you have any comments or feedback on either of these resources, please email them to jane.rawson@bodleian.ox.ac.uk. Bodleian iSkills is a series of free workshops designed to help you make effective use of scholarly publications and other materials in print and online. The workshops cover: searching for scholarly materials, reference management, keeping up to date, measuring impact, and submitting your thesis to the Oxford Research Archive. 1. Open Access, Open Data Publication Platform from Nature Publishing Group: Better Data = Better Science. Dr Susanna-Assunta Sansone (Oxford e-Research Centre and NPG Scientific Data). Monday 20th October 2014, 2-3pm, Radcliffe Science Library. Book a place. 2. Open Access Oxford — What’s Happening? (iSkills). Tuesday 21st October 2014, 12-1pm, Radcliffe Science Library. Book a place. 3. How Can the Wellcome Trust Help You With Open Access? Pamela Reid (Wellcome Trust) and Eli Harriss (Bodleian Libraries). Tuesday 21st October 2014, 3-4pm, Knowledge Centre, Old Road Campus. Drop-in session with tea. 4. The Open Library of Humanities: Gold Open Access for the Humanities Without Author-Facing Charges. Dr Martin Eve (University of Lincoln and OLH Co-Founder). Wednesday 22nd October 2014, 2-3pm, Radcliffe Humanities Building, (Lecture Room). Book a place. 5. Your Thesis, Copyright and ORA (iSkills). Sarah Barkla and Jason Partridge (Bodleian Libraries). 6. The new Charity Open Access Fund (COAF): What Researchers Need to Know. Friday 24th October 2014, 11.30am-12.30pm, Cairns Library, John Radcliffe Hospital. Book a place. A selection of the new books received in the library during September may now be seen on our website and the full list on our LibraryThing page.